Western blots, otherwise known as Immune blots, have a method analogous to the one outlined above. In brief, proteins are fractionated and denatured by sodium dodecyl sulfate (SDS)-polyacrylamide gel electrophoresis (PAGE). The size-fractionated proteins are then blotted onto a nylon or nitrocellulose filter, where—once fixed and blocked—they are probed by antibodies specific for the target protein. 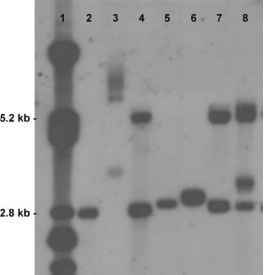 This primary antibody can be labeled, but most often the filter is probed with a labeled secondary antibody raised against the first (primary antibody rabbit, secondary antibody antirabbit goat antibody), and it is this secondary antibody that is detected. The primary antibodies should be specific for a single protein, and bind to an amino acid sequence rather than any posttranslational modifications, e.g., phosphorylation, that may have been applied. It is also beneficial for the antibody to be able to detect any epitopes of the protein, and so polyclonal antibodies are widely used, although they may create unsatisfactory high background levels. Monoclonal antibodies do not have this problem, but being specific for a single epitope could be problematic if the targeted epitope has not renatured after electrophoresis.